I have a data set that contains outliers (big orders) i need to forecast this series taking the outliers into consideration. I already know what the top 11 big orders are so i dont need to detect them first. I have tried a few ways to deal with this 1) forecast the data 10 times each time replacing the biggest outlier with the next biggest until the last set is run with them all replaced and then compare results 2) forecast the data another 10 times removing the outliers in each until they are all removed in the last set. Both of these work but they dont consistently give accurate forecasts. I was wondering if anyone knew another way to approach this? One way i was thinking was running a weighted ARIMA and work it so that less/minimal weight is put on those specific data points. Is this possible? please do not say about seasonality as this is only one type of data set, i have many ones without seaonality and i need the code to work for both types. Edit by javlacalle: This is a plot of the observed data and the time points defined in the first column of outliers. The OP insists in dealing with the points that are reported in the question as outliers without considering them as part of a possible seasonal pattern. Below I first give an idea to treat these points separately. In the second part of the answer I propose an alternative approach in the lines of the answer given by @Irishstat, which is a more appropriate analysis of the data. The effect of these observations can be weighted by means of regression on seasonal dummies (variables that take the value 1 at the time points related to the outliers and 0 otherwise). 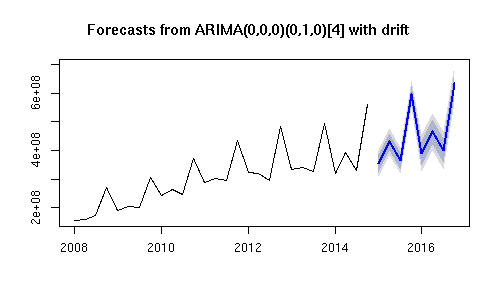 Then, an ARIMA model for the residuals of the regression could be fitted and used to obtain forecasts. It may be more efficient to estimate jointly the coefficients for the dummies and those of the ARIMA model, but I did not get a satisfactory result so I decided to split it in two steps as show below. There is high uncertainty in the forecasts (wide lower and upper bounds). Although not shown, the residuals do not show autocorrelation but there is some sign of overdifferencing. The choice of the ARIMA model should be explored further, but I think this gives you the idea. The series is relatively clean from outliers. None of the outliers initially proposed in the question were detected. Similarly to the results shown by Irishstat, the forecasts look now more reliable, since they reflect the overall dynamics of the data. To me it's essentially the choice between pushing the uncertainty of "big" shocks to the forecasts or to remove them from the forecast. For instance, you could identify the outliers and put dummies in those dates. Then your dummies will catch the uncertainty, and since you don't forecast dummies, these uncertainties will be trapped in the dummies. You seem to expect that big sales may happen in the future, but in the approach with outliers your forecast will not reflect this possibility. The second option is to leave the outliers in. In this case your error variance will increase, to the extent the big shocks are not correlated with your explanatory variables. Hence, when you forecast your confidence bands will widen reflecting the uncertainty you couldn't capture in your explanatory variables. After all you're not sure if the big shock would pop up at any time in future. the issue with this approach is that outliers often introduce bias in estimates, so it's not a clean packaging of uncertainty into the error term. Whether you go with one option or another is a matter of preference and circumstances. Not the answer you're looking for? 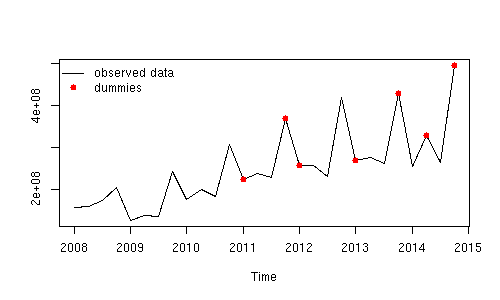 Browse other questions tagged r time-series forecasting outliers or ask your own question. Auto.arima vs autobox do they differ? Boosted AR for time series forecasting? 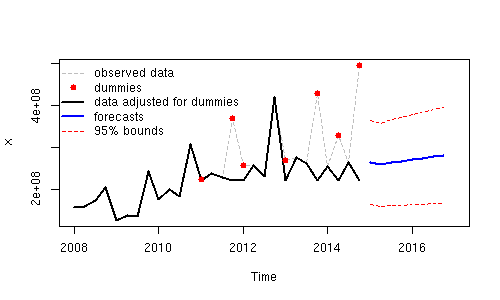 Is it possible to combine two time series with different frequencies for forecasting? 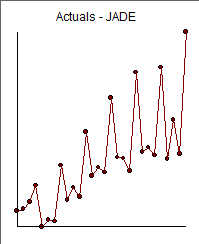 How do I determine an optimal threshold for a time series forecast?